Making a traditional Hollandaise, yolks in a vinegar reduction (all photos by Donna Turner Ruhlman). On Saturday night, sitting in the Ohio State Theater waiting for Jim Gaffigan to go on, I got a tweet from Elise alerting me that a website had stolen my text and Donna’s photos from the following post. Elise, creator of the site Simply Recipes and vigilant crusader for blogger rights and general Internet justice, also sent me a link to the Google page to report copyright infringement. I wrote to Google, and the folks there had the theft taken down within days. So here’s a prime example of the very hard work Elise does, not just her consistently excellent publishing at Simply Recipes, but also her work on behalf of other bloggers. And also the mighty Hollandaise, one of the all-time great sauces for eggs, for vegetables, for fish … hell, I could just eat it plain!—M.R. A classical French Hollandaise sauce is an emulsified butter sauce that is almost like a mayonnaise, nearly that thick, and, as I was taught it, includes an additional flavoring step, a vinegar reduction. It’s considered difficult and temperamental but is neither, as long as you pay attention and don’t let it know that you’re afraid of it. Emulsified butter sauces can sense fear and will break on you if you let them (if it does, just whisk the broken sauce into a clean teaspoon of water and you’ll have it back in moments). 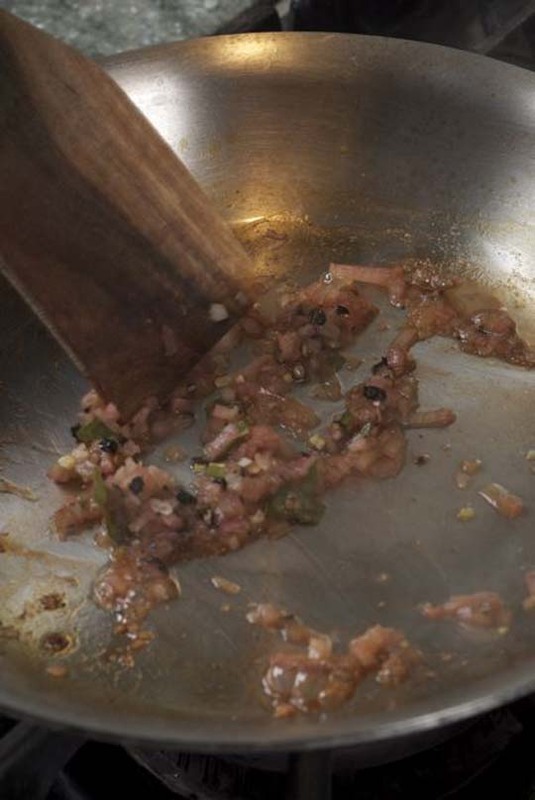 Ingredients are as follows (the recipe, ratio, and variations on it are in Ratio); I’ll describe the method with pix below: 1 tablespoon minced shallot; 10 or so peppercorns, cracked; a crumbled bay leaf (parsley, thyme if you have some); a three-finger pinch of salt; 1/4 cup good vinegar; 3 egg yolks; lemon juice to taste (1 to 3 teaspoons); 8 ounces (two sticks) butter melted in a vessel you can pour a thin stream from; cayenne to taste (optional). Notice I’ve just roughly chopped the shallots; they’ll be strained out later. You do want them small enough to impart their flavor, however, in the brief time they’re cooked. This is the reduction taken to sec. All the strong acidity is gone, leaving only the flavors, and a little caramelization in the pan. Now you need to capture those flavors by adding the amazing ingredient we call water to the pan, about 1/4 cup. Bring it to a simmer, and strain it into a saucepan. Taste this, so you know what you’re talking about. 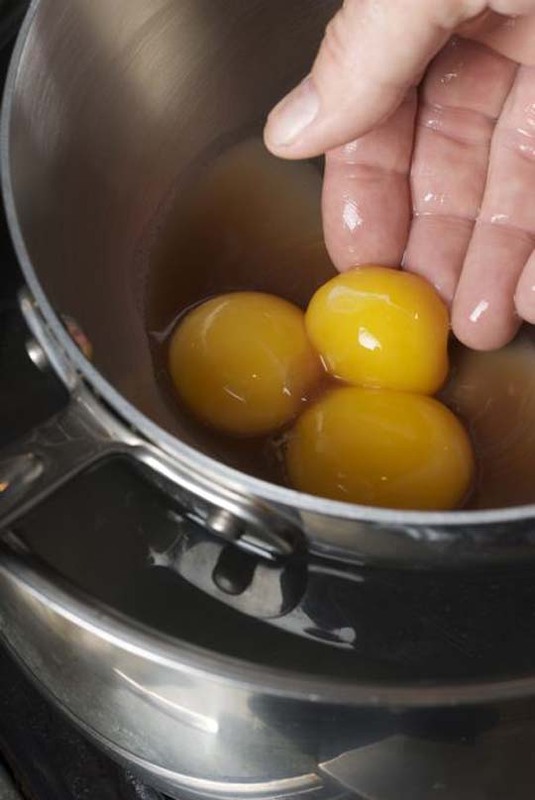 Add the egg yolks to the reduction (top photo). 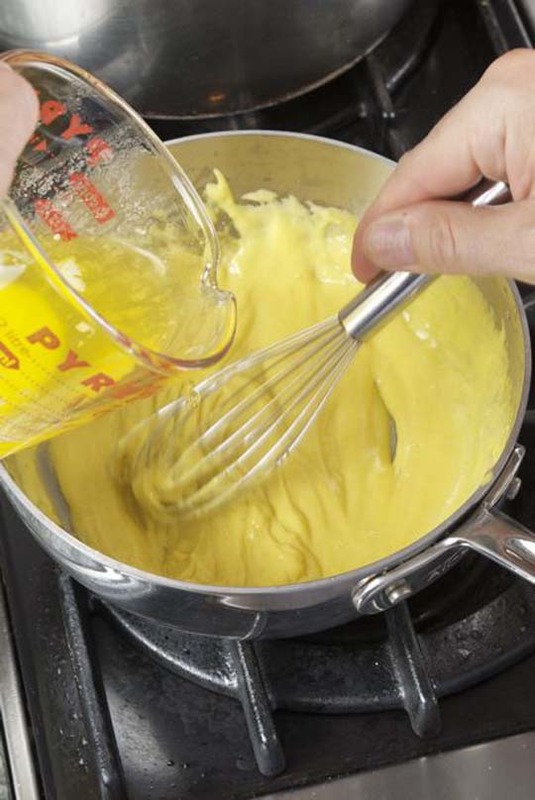 Traditional Hollandaise uses clarified butter. I simply melt my butter in the microwave, spoon off the froth at the top, and pour all the clear butter fat directly into the cooked yolks off the heat. You don’t need to cook this sauce any more. As with a mayonnaise, you need to first add just a few drops of the melted butter, whisking it in quickly to establish your emulsification. Once it’s going you can pour the butter in a steady stream, whisking continuously, till all the butter’s in. Don’t worry if some of the watery whey goes in as well; it can only help (I discard what’s left when all the butter’s in). We had some beautiful asparagus from the market, which is why I made the Hollandaise (that and Elise’s suggestion!). It’s beautiful with artichokes, on fish, on eggs. I love a good Hollandaise sauce. It should be part of the first from-scratch challenge, suggested by Matthew and a few others. Eggs Benedict doesn’t require a growing season since it is just eggs, Hollandaise, Canadian bacon, and an English muffin. 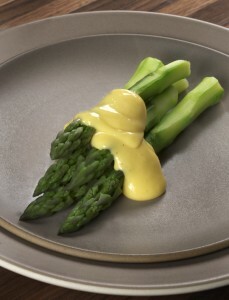 Whereas using asparagus does require a growing season, so grab up the remaining asparagus while it lasts and serve it with a traditional thick Hollandaise. Many people have questioned the reduction in this Hollandaise, even the redoubtable Hunger Artist, so clearly this is worth addressing. Some reliable sources, from Larousse to St. Julia, use only lemon juice for flavoring. Again, as there are no absolutes, this is fine. I’m sticking with using a reduction for a few reasons. First, because Escoffier, the first person to codify and classify contemporary French cuisine in Le Guide Culinaire, includes a reduction in his Hollandaise. That alone seals the deal for me, as he created the standard. Second, it was the way I was taught it at the Culinary Institute of America, which prides itself on fundamentals and tradition. Third, and equally as important as reasons one and two (if not more so): it tastes better, more complex, and more interesting, and has more depth. So, my bottom line is that a traditional Hollandaise does use a reduction (and, besides, it’s a fun technique to have in your arsenal). But: a Hollandaise made only with butter, egg yolk, and lemon is justifiably called Hollandaise as well (as opposed to, say, vodka and vermouth being called a martini). And, finally, the difference between a Hollandaise and a Bearnaise is that a Hollandaise has no tarragon. Bearnaise has abundant tarragon. 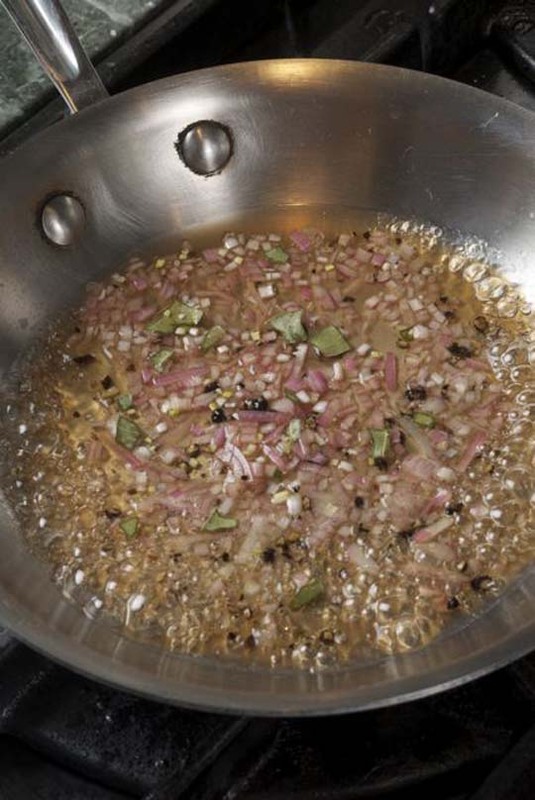 I use a good dried tarragon in the reduction, and add plenty of fresh chopped tarragon just before serving. A couple people have commented on reusing Hollandaise. If you have leftover Hollandaise, you can refrigerate it and reuse it. To reuse, melt it in a microwave, then simply reemulsify it into a little bit of water, just the way you would fix a broken sauce. 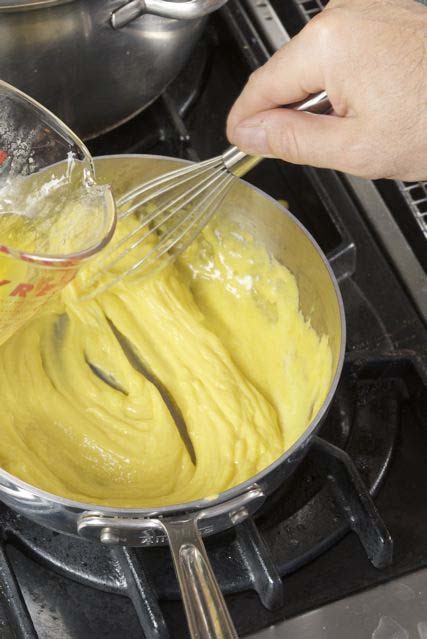 Elise’s recipe from Simply Recipes for an easy blender Hollandaise sauce. Learn how to poach eggs and take a look at my badass perforated spoon. Now THERE is a hollandaise done well! Much better looking than the last time you talked about hollandaise!! Great notes. Hollandaise is something I make so rarely that I’ll take whatever help I can get on the finer points. The first time I made this from Ratio, it came out perfect and tasted great. This is one recipe I will not bother to keep trying to find the “perfect” version.